I love my winter coat! The bright green of the wool can be seen far in the distance and it always brings people lots of cheer. Coats were always incredibly functional as I was growing up desgiend to keep me warm. Often as part of a school uniform, more a blazer, and always too large in size. Due to my parents philosophy of ‘you’ll grow into it’. A coat was never part of my wardrobe staples despite needing one when I lived in colder areas of Australia. They didn’t seem to be marketed as outfits in themselves or fashionable pieces like they are now. The first time I really needed a coat as an adult I bought a black leather trench. Living in Brisbane the coldest the winter would get was 20 degrees. Leather coats were an incredibly fashionable item and the one of the national brands had a long black trench coat that my heart was set on. With a price tag of over $400 this was not something I could buy straight away and I remember setting up a layby making payments over a two month period. Working in a bakery and babysitting for local families, each week I would go instore and pay off another $50. The ladies were so lovely and if it was quiet let me try on the leather coat before putting it back away. For my birthday that year my then boyfriend ‘surprised’ me by paying off the last instalment and presenting the trench to me. To this day the disappointment of his gesture still smarts. He was very aware that I was excited about purchasing this item myself and him finishing it off felt like a power move on his part. The whole relationship was like that but that’s for another time. Pushing those feelings aside I wore that coat and received so many compliments. The winters are short in Australia so after a couple of months I could tuck it away for the next year, keeping it fresh for another day. My second winter coat was gifted to me at one of my first jobs in London. Travelling to a colder climate I had my lovely leather trench coat but soon realised that it was useless against the chilled air! Despite being told by numerous people that leather is great for coats I found that all to be a lie. No one wears leather for winter in Europe! Sitting as a temp in the Kookai offices in South Kensington, my job was to input all the stock into their system. It was great fun as I as I sat next to the cupboard full of all the samples. Filled to the brim the cupbaord was overflowing with sample dresses, trousers, handbags and coats! It was October and when my six week placement was up they presented me with the sample of their current best seller. It was a black coat with a woven baggy shape, accentuated by the fact it was three sizes too big for me! I didn’t care! It was lovely and warm and meant I didn’t have to spend money I didn’t have on another coat. That second coat saw me through that brief life in London and back to Melbourne where I studied and worked for five years. The entire time I was plotting my return to the UK. I loved that coat and it was only moving to London for the forth time, living through some long winters that I fell out of love with the colour black. After a lot of searching both here and with Australian fashion brands I found my beautiful green coat with an Australian brand David Lawrence. I have a few different colourful trench coats and they are all from this same brand. I studied the green coat for weeks watching it go into the sale and constantly reviewing its fabric composition to determine if it would be warm. My nervousness was the price and cost of shipping. 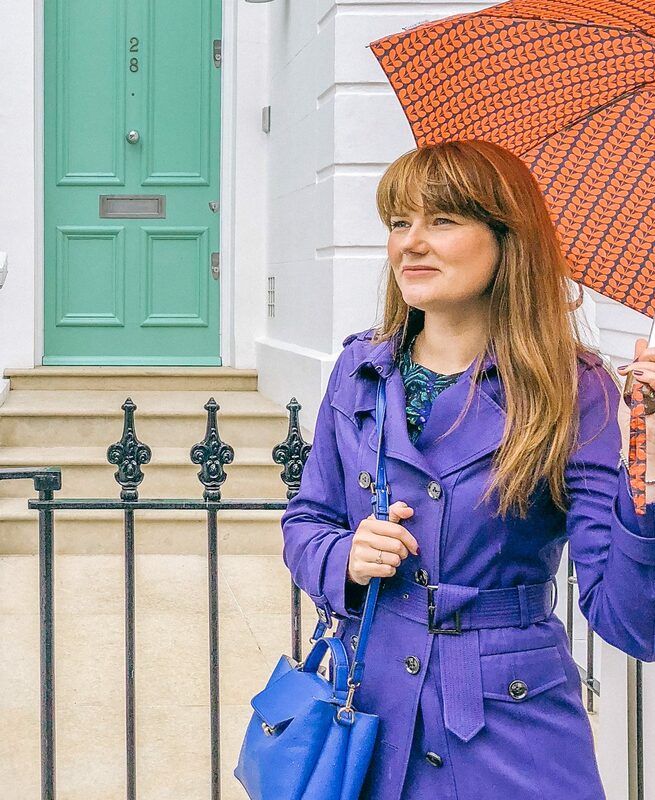 There was no way that if I didn’t like the coat I could afford to return it and I was so unsure about the colour. 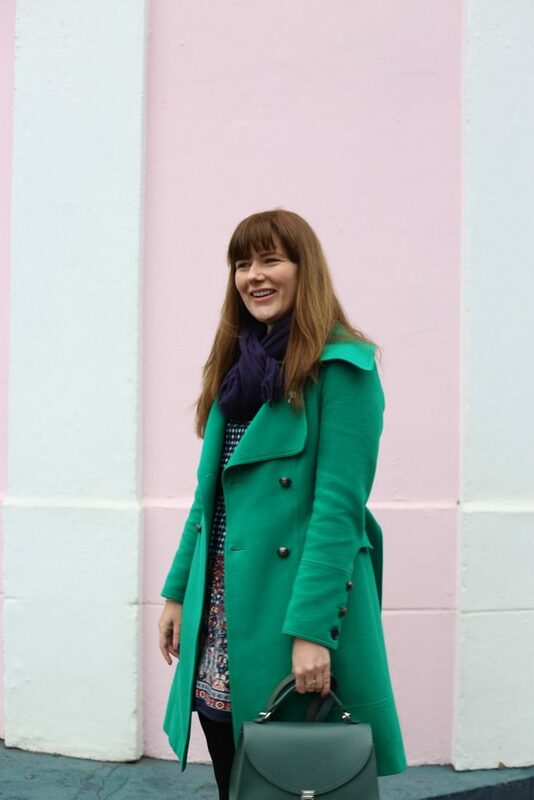 I’ve never worn green of any shade and as you know this coat is bright! Taking the plunge I remember sitting in my flat opening the huge parcel. The emerald green fabric peered through the plastic and I felt it was practically singing to me! It was love at first sight especially as it wasn’t as lime as the online pictures had me believing! I’ve owned this winter coat for five years and it still brings me so much joy through the winter months. The black winter coats were donated long ago to charity and if I had a pound for the number of comments I get for my green coat on a daily basis, well we’d all be having a fancy dinner on me! Each time I put on my green coat to rug up against the weather I feel a lovely sense of cheer and warmth. An occasional button has fallen off and I have rearranged them to add my own ones on the sleeves. 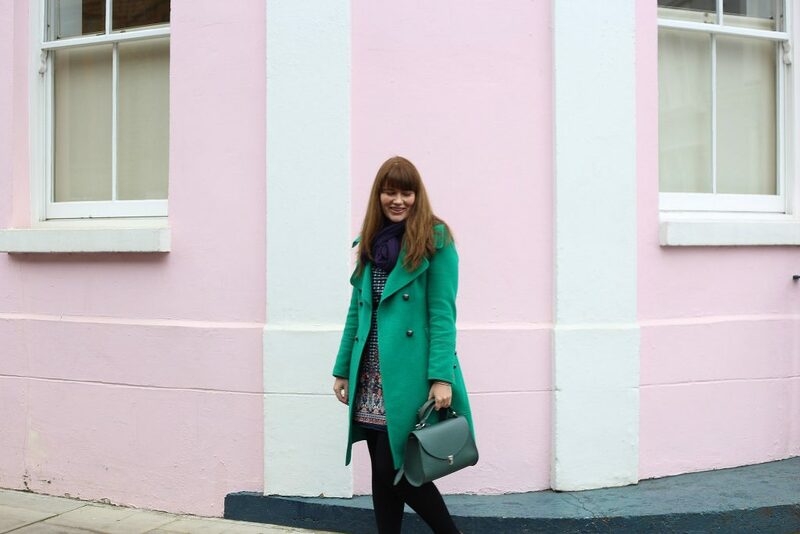 Personalising the emerald green coat to be truly mine. I have seen people smile at the coloufulness of the emeral green and many a person has stopped me to ask where it is from. This past season I noticed there were more green coats in stores and it was so nice to be able to tell people they could find a version elsewhere. Aw! It became a bit more of a story then I thought. Nice to record my winter coat history!! !